Emergency Survival Kit For Two People is a 72 Hour emergency kit packed with survival food rations, emergency water, survival tools, a premium first aid kit, and sanitary supplies. 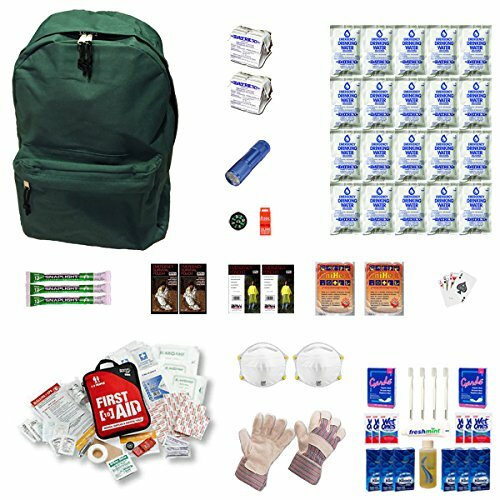 This two person kit is designed for families living in a city or urban environment and includes all of the core survival essentials recommended by FEMA and Red Cross. (1) Green 16" Backpack, (20) Datrex Emergency Water Packs (4.2oz each), (2) 2400 Calorie Datrex Survival Food Packs (twelve food bars per pack), (2) BRW Emergency Sleeping Bags (waterproof, windproof, and lightweight), (2) BRW Ponchos, (2) 24 Hour Body Warmers, (3) Snaplight 12 Hour Light Sticks, (1) Button Compass, (1) Emergency Whistle, (1) Deck Playing Cards, (2) N95 Dust Masks, (1) Pair Heavy Work Gloves, (1) Adventure Medical First Aid Kit 1.0, (1) Sanitary Kit. If you have any questions about this product by Zippmo Survival Gear, contact us by completing and submitting the form below. If you are looking for a specif part number, please include it with your message. Ven-Ex Snake Bite Kit, Bee Sting Kit, Emergency First Aid Supplies, Venom Extractor Suction Pump, Bite and Sting First Aid for Hiking, Backpacking and Camping. Includes BONUS CPR face shield.